This post is based on some very useful references provided in a comment to my prior post on the Cato Institute evaluation of the freedom in the 50 States 2016. Between 1992 and 2014, the IRS tracked the migration of people and their AGI on their tax forms. The net results of these migrations are indicated in this map where red is a loss of income due to net migration and green is an income gain. Out migration from California tends to be strong to Arizona, Nevada, Washington, and Oregon. All of these states are more free than California and the least free is Oregon, which perhaps explains why its income increased the least of these four states. 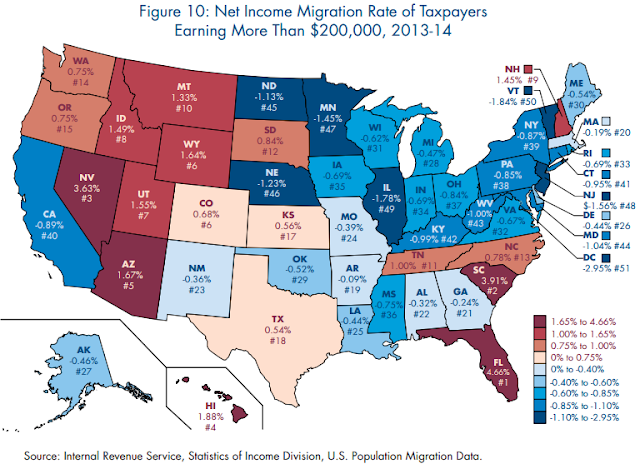 New Hampshire, the freest state, had a small increase in income due to migration. Oklahoma and Alaska were #3 and #2, respectively, and both have risen in recent years in freedom, so their newly deserved reputations were not yet established in many of the years 1992 - 2014. Indiana at #4 has been more stable in its freedom and clearly has performed much better in minimizing losses than its neighboring states of Illinois, Michigan, and Ohio in this time period. Indiana's weakest ranking of #26 was in fiscal policy which includes taxes and that is a particularly strong factor on the out-migration of income. 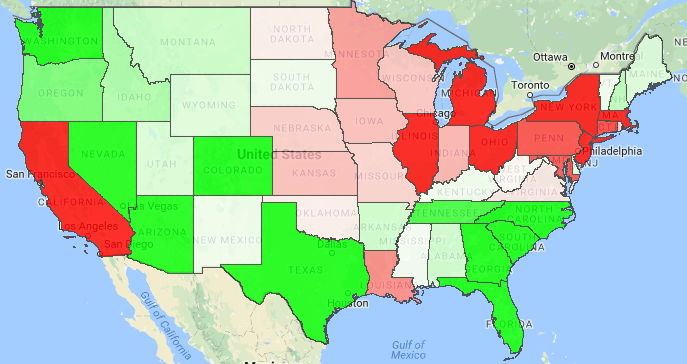 Tennessee, Idaho, Florida, and Arizona of the 10 most free states are also all green in this income migration map above. #5 South Dakota is white, or income neutral, and #9 Iowa is pink. Overall, the freer states were the Rocky Mountain states, the Great Plain states from Oklahoma north, and the Southeast with the exception of Mississippi, Louisiana, and Arkansas. There are no red states in these areas. Nebraska, Iowa, Missouri, and Kansas are pink, but three of these states are in the #16 - #25 grouping for freedom. Missouri is further hurt by not being a Right to Work state. In the map, the bluer the color the greater the loss of taxpayers earning more than $200K a year. We also find that most of the low freedom states have higher losses than do high freedom states. All of the 9 states with gains equal or greater than 1.00% are in the top twenty most free states by the Cato Institute ranking. 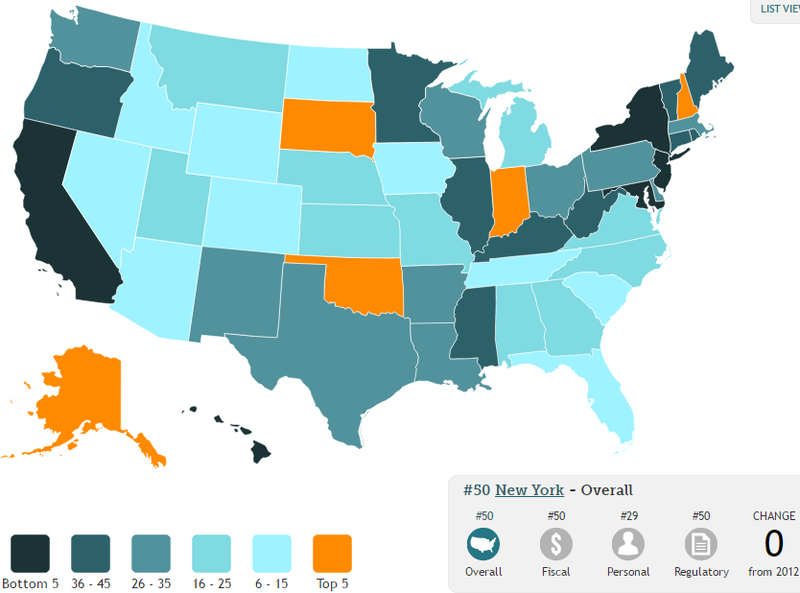 Tax policy is under the Fiscal Policy ranking and in this area South Carolina is ranked #23, Nevada is #25, and Wyoming is #21, so there is a stronger correlation with the overall freedom ranking than there is with the Fiscal Policy ranking subset of freedoms for these high income in-migration states. Some of these high in-flux states do have very high Fiscal Policy rankings, however, with New Hampshire, Tennessee, Florida, Montana, and Idaho having Fiscal Policy rankings from #1 to #8. So general freedom may be more important for a subset of the wealthier migrators and tax policy alone may be the most important factor for another subset of these wealthier migrators. Overall, I would judge it likely that income migration is affected strongly by tax policy, but it is also affected strongly by a desire for freedom in general. Different people have different weightings on these aspects of freedom in their personal set of values. Good government seeks to provide everyone with the freedoms their individual rights entitle them to. When a state government offers a better service to freedom, rational and productive people will come to that state. Good things happen to states and the local communities when more rational and productive people choose to live there. It is interesting that the five most authoritarian states, New York, California, Hawaii, New Jersey, and Maryland are all more greatly deviant from the norm of freedom than is the freest of the states, New Hampshire. If you value your freedom, it is particularly important to avoid these most negatively rated states. New York is about three times more negative than New Hampshire is positive. In fact, New York is almost twice as bad as either of the next two worst states, California and Hawaii. If one were to move from New York to New Hampshire, the freedom score would increase by 1.3082. Or if I were to move from authoritarian Maryland to where much of my family lives in Oklahoma, my score would improve by 0.6830, which is a substantial increase in freedom. Or if you live in the Washington, DC area, living in Virginia offers a big improvement over living in Maryland by 0.5080. If you have to live near New York City, Connecticut is substantially more free than is either New York or New Jersey. Of the 10 most free states, all are controlled by Republicans, except two which had divided government in 2014. Of the 10 most authoritarian governments, all were entirely controlled by Democrats in the governorship and the legislature, except the two least repressive of that set of the 10 worst, who had one of the three legs of the state government in the hands of Republicans. It is not uncommon for libertarians to claim that the Republicans are every bit as anti-freedom as the Democrats, but these rankings make it clear that the Republicans are significantly better than the Democrats in most cases. Indeed, one of the main reasons that the mean state freedom rankings are so much better than those of the most repressive states is because far more states are controlled by Republicans than are controlled by the more adamant deniers of individual rights found in the Democrat Party. XXXI Olympiad competitors are joyfully showcasing their skills and sportsmanship, while delighted fans revel in their amazing efforts. But opening ceremonies featuring colorful history, dance, song and athletes were rudely interrupted by an unprecedented propaganda film. As audiences around the world were getting pumped up in eager anticipation for the upcoming events, a slick but deceitful video soured the mood by inserting partisan climate change politics. Fossil fuels are warming our planet, and the manmade heat is melting its ice caps, narrators intoned. Animated maps showed Greenland “disappearing very quickly” and Amsterdam, Dubai, Miami, Shanghai, Lagos and Rio being swallowed up by rising seas. Well, yes, if average global temperatures really did soar 4 degrees Celsius (7.5 Fahrenheit), and if all of Greenland’s ice melts, oceans certainly could rise 20 feet and other terrible things certainly could happen. But wild assumptions, computer models and animations are not reality. Few of us are really worried about being eaten by raptors and Tyrannosaurs cloned from DNA in fossilized amber, even though Jurassic Park sure made them look real. Ditto for Hollywood sharks, werewolves, cave monsters – and global warming. In the Real World outside the animators’ windows, average planetary temperatures barely budged for 18 years. After climbing a headline-grabbing 0.55 degrees C (1 deg F) in 2015, a strong El Niño year, they plummeted a media-ignored 0.5 degrees C the first seven months of 2016, as La Niña approached. That’s a far cry from the 4/7.5 temperature spike that animated the animators’ fear-mongering. The sun has entered a low-sun-spot phase, possibly heralding a new colder period for Planet Earth. As to temperatures increasing “since the industrial era began,” that primarily reflects Earth’s emergence from the 500-year Little Ice Age. Of course, climate alarmists happily claim this natural warming is due to mankind’s growing fossil fuel use during the same period of time, though scientists still cannot distinguish human and natural factors. With temperatures rising 1850-1940, cooling 1940-1975, warming 1975-1998, and mostly flat-lining since then, it’s hard to blame oil, gas and coal for any warming. News stories about the Rio video also featured claims that climate change has “already had real effects in Brazil,” where 60% of the Amazon rainforest is located. Some 240,000 acres were clear-cut just in June 2016, “as a result of deforestation” – related to global warming, it was slyly suggested. If they’re talking about replacing rainforests with biofuel plantations, to replace fossil fuels that could be produced from a fraction of that acreage, then yes, there’s a climate (policy) connection. But there would be little need to chop down all those trees if climate chaos campaigners weren’t obsessively opposed to the fossil fuels that power 80% of the world’s economy and provide other vital human needs. The indispensable benefits of hydrocarbons and petrochemicals for Olympic Games alone are impressive. They are the raw materials for uniforms of every description; swim suits, goggles and caps; kayaks and kayaker helmets and paddles; bicycle helmets, shoes and carbon-fiber frames; basketballs, vaulting poles, tennis balls and racquets, soccer balls and shin guards; bows and arrows; volleyball and field hockey nets; basketballs [Paul really likes basketballs]; seats and clothing for fans; prosthetics and wheelchairs for Paralympians; and much more. No one could watch the games without plastics for computers, cameras, monitors, cell phones, dish antennas, banners and other equipment that promote, record and transmit the events. Neither athletes nor fans could get to the games without airlines, vehicles and fossil fuels. In short, virtually nothing we make, grow, eat, use or do is possible without fuels and materials that come out of holes in the ground somewhere on our planet. But radical greens want it all put off limits. They would rather see billions of acres of croplands, rainforests and wildlife habitats cleared and plowed – and trillions of gallons of water and fertilizer expended – to grow biofuel crops to replace fossil fuels. “Keep it in the ground,” they demand. African, Asian and European countries cannot afford to stop using oil, natural gas or coal. Nor can the United States or any other modern or developing country. Naturally, the video and news reports mentioned none of this. So why did the Rio organizers agree to present this manmade climate cataclysm video? One possible reason is a desire to distract people from its real problems. Mosquitoes are spreading Zika. Shoddy athletic housing has bare wires and sinks falling off walls. The open-water swimming venue is a bacteria-infested open sewer. Swallowing just a few teaspoons of Rio’s tap water will make visiting athletes and fans horribly sick. Eleven construction workers died while preparing Rio for the games. Brazil’s economy is on the rocks and #174 out of 189 nations for starting a new business. Its current and previous presidents are under investigation for corruption. But once the games got underway, they were fantastic, fun, exciting and dramatic; their own distraction. So the video could be simple “greenwashing” – making the 2016 games the “greenest ever.” Or it might be to reinforce Brazil’s claim to billions of dollars that Barack Obama and Hillary Clinton have promised for mitigation, adaptation and compensation for the climate chaos we supposedly caused. Just as strange, even ExxonMobil played the politically correct climate game. Its Olympics TV ad says the company is doing all it can to reduce “carbon pollution.” Surely Exxon knows it’s not carbon (soot); it’s carbon dioxide. And it’s not pollution; the plant-fertilizing CO2 is enriching the atmosphere and making forests, grasslands and food crops grow faster and better. So why use Obama/EPA terminology? The journalists reacted in disbelief. “Is he insane? Is he on drugs?” asked one. “What did you expect from a president who never served in the military and never worked a day in his life?” said the second. “I’m sure he’s not deliberately trying to destroy his country,” the first suggested. “Of course he is,” the third said. Now millions of Americans appear perfectly willing to sacrifice their livelihoods, living standards, liberties and country on the altar of manmade climate Armageddon. Are they insane? Are they on drugs? ­­­­­­­­­­­­­­­­­­­­Paul Driessen is senior policy analyst for the Committee For A Constructive Tomorrow (www.CFACT.org) and author of Eco-Imperialism: Green power - Black death. Unfortunately, the Republicans have once again chosen a presidential candidate who is unable to and uninterested in fighting a major suppression of individual rights, namely the Patient Protection and Affordable Care Act known as ObamaCare. This big government effort to claim the collective ownership of everyone's mind and body should still be a critical issue with those of us who value our liberties. Twenty-three plans, funded with $2.4 billion in government loans, opened enrollment in 2013. By the end of 2015, 12 plans had failed, leaving $1.3 billion in delinquent loans, more than 700,000 people in 13 states scrambling for coverage, and hospitals and doctors with hundreds of millions of dollars in losses uncovered by the assets of the failed co-ops. This result is hardly surprising. The people running the co-ops had no experience running an insurance company — co-ops were forbidden to have anyone affiliated with insurers on their boards. Their premiums were too low and their benefits too high. The failed co-ops went on to lose $376 million in 2014 and more than a billion in 2015. Only one co-op turned a profit in 2014, and all lost money in 2015. In the seven years 2009 - 2015 under Obama, the rate of real GDP growth has averaged 1.4% a year. It takes zero increase in productivity to increase the GDP at the rate of growth of the population. Over the six Obama years 2009 - 2014, the population of the USA has decreased from an initial high of 0.98% in 2009 to a 2015 rate of 0.77% as hope has died. The average population rate over those six Obama years was 0.91%. The real, per capita GDP growth rate is then about 1.4% - 0.9% = 0.5%. This real, per capita GDP rate is the rate that actually tells us how fast our standard of living is improving. A 0.5% annual rate is pathetic and the result of a serious national malaise. Hillary would continue down this sorry path. That path is looking even worse so far this year. The 1st quarter real GDP growth rate was just revised downward to 0.8%, while the second quarter rate was reported to be 1.2%. Subtract the population growth rate to estimate the per capita real GDP growth rate and that rate so far this year is less than the 0.5% of the prior Obama years. As is the case with Obama, Hillary knows nothing about economics or how to grow a business. Nonetheless, many Americans will be voting for more of the same in a few months. Let us examine a crucial consequence of adopting the Obama-Hillary new economic growth normal with a government taking huge chunks of the private sector economy under its dictates year after year. Let us compare the resulting size estimates for real per capita GDP based on a 0.5% Democratic Party rate of growth and a number of rates of growth which could be achieved by more rational economic policies giving us lower tax rates, fewer regulations, no irrational laws, and no violations of the Rule of Law. Most Americans can expect to live another 40 years. So let us ask what the size of the economy in terms of the real per capita GDP will be 40 years from now should we forego big government controls for a free and robust private sector economy. Growth rate of 0.5%, real, per capita GDP in 40 years is 1.22 times the present case on the Obama - Hillary course. Growth rate of 2.0%, real, per capita GDP in 40 years is 2.21 times the present case, with economic policies marginally less irrational than those of Obama - Hillary. Growth rate of 3.0%, real, per capita GDP in 40 years is 3.26 times the present case, with economic policies based on a modest level of rationality. Growth rate of 4.0%, real, per capita GDP in 40 years is 4.80 times the present case with a free market economy. If we measure the size of the real, per capita GDPs at higher growth rates as ratios to the Obama - Hillary new normal 40-year economy, the economy is much larger. 2.0% growth, the economy is 1.81 times larger. Do we really love the big government directed economy of Obama - Hillary so much that we wish to forego an economy in 40 years which is 2, 3, or 4 times wealthier than it is now for one that is only 22% larger than it is now? We are not just giving up several times more wealth, but we are also giving up all of the extra inventions, the extra funding for science, the extra funding for medical research and its clinical applications, the additional knowledge, the greater national security, improved housing and retirement, and the abundance of interesting and challenging jobs of such robust and diverse economies. Does the big government model really offer anything to improve our standard of living that begins to compare to what we are giving up by adopting that model of human and economic controls? It is absolutely inconceivable that the Obama - Hillary 0.5% real per capita GDP growth rate is the rational choice. This is truly a case of checking out the claims of someone who is claiming to offer you something for nothing. There is clearly an alternative outcome one can choose and that outcome, consistent with liberty, is vastly superior for our personal security and our desire to flourish in life. The freebie is purchased most dearly. One is reminded of Ayn Rand's frequent refrain that we should ask when offered a packaged deal, "Instead of what?"